Overview - Premiering on PBS's Masterpiece Mystery, the best-selling novels of Michael Dibdin come to life in these breathtaking new adaptations from PBS and the BBC. Aurelio Zen (Rufus Sewell, John Adams) is a formidable detective, but he's always put honesty before advancement. The arrival of clever and ambitious Tania (Caterina Murino, Casino Royale) to the team sees Zen's vigor reawakened. Driven by romance, re-energized and armed with a new confidence, Zen's investigations take him from crowded Rome to the spectacular Italian countryside, as he negotiates a complex string of murder cases, never afraid to question authority or use a few unorthodox methods to see justice done. Rufus Sewell brings passion, intrigue and humor to author Michael Dibdin's character in this series set against a visually rich backdrop of Rome at its most stunning. Who doesn't love a good mystery? Really, there's just something about a well told detective yarn that keeps audiences glued to their seats and willing to flock back to the screen time and time again. With their twisting plots, large casts of possible culprits, and intriguing cases, viewers simply love following the carefully laid out clues, trying to solve the case themselves before the onscreen hero inevitably puts all the pieces together. From the BBC, and PBS's Masterpiece Mystery, 'Zen: Vendetta / Cabal / Ratking' is a basic detective series, that sees a likeable investigator (Rufus Sewell) tackle a variety of cases while juggling pressures from his superiors, his developing love life, and an assortment of unsavory characters who constantly want him dead. Though the show is certainly competent in execution, and the cast is very talented, the end results are often conventional and predictable, leading to a serviceable, but never unique show, that simply gets lost in the shuffle of other superior takes on the genre. The series is based on author Michael Dibdin's Aurielio Zen detective novels, and follows the title character as he tries to solve crimes the old-fashioned, honest way. The show is made up of three ninety minute episodes, and each installment takes on a completely new mystery, while still carrying over personal plotlines from the previous adventure. The first episode, titled 'Vendetta,' introduces us to Zen and his supporting cast of characters, as he tries to unravel a murder mystery and avoid the deadly hands of a vengeful criminal he once put away. The second chapter, called 'Cabal,' features a suicide case that may not be as simple as it first seems, carrying a possible link to a much greater conspiracy. The final installment, 'Ratking,' chronicles a kidnapping incident and subsequent ransom attempt that might require Zen to compromise his usually steadfast principles. Tying all of these separate storylines together, are ongoing developments between Zen and his politically manipulative bosses, and a romantic relationship that forms between the detective and a beautiful secretary named Tania (Caterina Murino). The cast is the real highlight here, and Sewell excels in the leading role. I've been a big fan of the actor since I first saw him in 'Dark City' and don't think he's ever really been given the credit or attention he deserves. As Zen, Sewell provides an entertaining, multifaceted performance. All he really wants, is to do his job right, but he's constantly forced to go through complicated maneuvers to do so. Though very intelligent and charismatic, Zen isn't always ahead of the game and more often than not we actually find the unlucky detective on the wrong side of a punch or loaded gun. Seriously, the man is almost always sporting at least a few bruises on his face, and the frequency in which criminals force him to get into backseats or trunks at gunpoint, becomes an ongoing point of amusement. This more human, less action hero approach, provides a nice, realistic, and relatable quality to the proceedings, and it is the actual character of Zen, and Sewell's interpretation, that really makes the whole series work. As his love interest, the sweet and gorgeous Tania, Caterina Murino is also strong, bringing a smoldering presence to the screen. The pair's chemistry is great, and their scenes together come across as natural, romantic, and playful. Unfortunately, Murino's Italian accent can be a little hard to make out, but her performance still manages to shine through. The actual plotting of the series can leave a bit to be desired, and it's in the mysteries themselves that 'Zen' fails to really standout. The episodes are little more than basic detective stories, that cover very been-there-done-that material. As the cases start to unfold and new suspects are introduced, it often becomes easy to piece together what's really going on. Even when the plotting is a bit more complicated there's still never really much to get emotionally invested in, and the actual reveals aren't all that interesting. On top of that, there's nothing about Zen's various detective methods that ever truly seems fresh or unique. Essentially, the bulk of the show simply amounts to scene after scene of Zen questioning various suspects, and the long conversations can get tedious. This wouldn't necessarily be a problem, if other aspects of the series were more exciting, but the visuals and direction are also less than stimulating. Throughout the series, it looks like the filmmakers are trying to emulate some of the lighter, quirkier detective shows and films of the 1960s, with a very retro style main title sequence. Frequent shots of beautiful, lavish Roman locales, and even some occasional zooms and quick pans also turn up, directly echoing European thrillers of yesteryear. While these little stylistic touches are nice, they sort of disappear as the production goes on, and the majority of the proceedings fall into a fairly dull and purely functional visual routine. Thankfully, there are a few action scenes peppered throughout that are handled well, but they can't really make up for the lack of excitement that plagues the vast majority of the series. 'Zen' actually has quite a bit going for it, mainly a likeable and charismatic lead character, but the twisting turns of its plotlines aren't as interesting or fresh as they need to be. Aurielio Zen is certainly a strong protagonist, but an intriguing personality just isn't enough to overcome the program's other shortcomings. In fact, it seems I'm hardly alone in my criticisms, as the show has been officially cancelled by the BBC, though apparently the creator is shopping it around to other networks. Despite its flaws, I actually do hope it gets renewed for a second season elsewhere, as the end of the final episode sets up a fun, new dynamic that could inject some much needed life into future installments. It may not be among the best the genre has to offer, but for fans of classic mystery tales, 'Zen' is still worth a look. 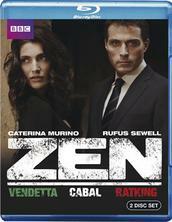 The BBC brings 'Zen: Vendetta, Cabal, Ratking' to Blu-ray on two BD-50 discs housed in a standard case. After some logos, warnings, and skippable trailers, the disc transitions to a standard menu. Disc one includes the show's first two episodes, 'Vendetta,' and 'Cabal.' Unfortunately, the menu only features "play all" and "scene selection" options, so in order to start just one episode, you must go into the scene selection submenu and actually choose the first scene. The second disc contains the final episode, 'Ratking,' as well as the lone special feature. The show is provided with a 1080i/AVC MPEG-4 transfer in the 1.78:1 aspect ratio. Shot digitally in high definition, the program has a mostly pleasing but never exceptional look. The source is clean, and despite the interlaced presentation, there are no major signs of artifacting. With that said, noise is visible from time to time. Detail is fairly good, particularly in close-ups, but medium and wide shots can sometimes look soft and rather flat. Colors are nice, but lack a bit of pop. Black levels are solid in well lit scenes, but can look a little washed out in nighttime sequences, and alternatively, whites appear blown out in daytime scenes. 'Zen' looks decent and the cinematography makes some good use of the extravagant Italian locations, but there is nothing about the video that's particularly impressive. It won't be turning heads, but the transfer gets the job done. The series is provided with an English Dolby Digital 2.0 audio track. Though the mix itself features some solid effects work, the lossy audio lacks fidelity and range. Dialogue comes across OK, but can sound a little muffled at times and there are some instances of crackle in the high frequencies. Directionality across the two channels can be strong, particularly in the action sequences which feature good separation across the small soundstage. Dynamic range is decent, but not on the same level as lossless surround mixes. Bass presence, however, is nice, especially in the show's music and effects. Balance between the audio elements is all right, but dialogue can occasionally get swallowed up. This isn't a bad audio mix, but the lack of a lossless presentation and surround channels, does diminish the overall effect of the track. Zen - An Italian Adventure (SD, 31 min) - This is a standard behind-the-scenes look at the show's production with cast and crew interviews. Some background information is given on the original novels, as well as details on shooting in Italy, developing the personality and look of Zen, deciding to cast British actors as Italian characters, and the fun chemistry between the two leads. While a more comprehensive look at the series and some commentaries would have been nice, this is still a worthwhile inclusion that fans should definitely check out. 'Zen: Vendetta/Cabal/Ratking' is your basic detective show. Its main character is interesting, but the plots are far too conventional and mostly uninvolving. The video transfer is solid, but the lossy 2.0 presentation is decidedly average. With only a single half hour featurette included, supplements are certainly lacking. Still, big fans of the original novels, or classic detective stories in general, may want to check this out.